Despite living in Pennsylvania for over a decade and exploring areas from the Poconos to Pittsburgh, we had never ventured to the center of the state. The center (quite literally, Centre County) is full of historic towns with charming B&Bs, great parks and natural attractions, and the hub of activity that is State College, Pennsylvania. 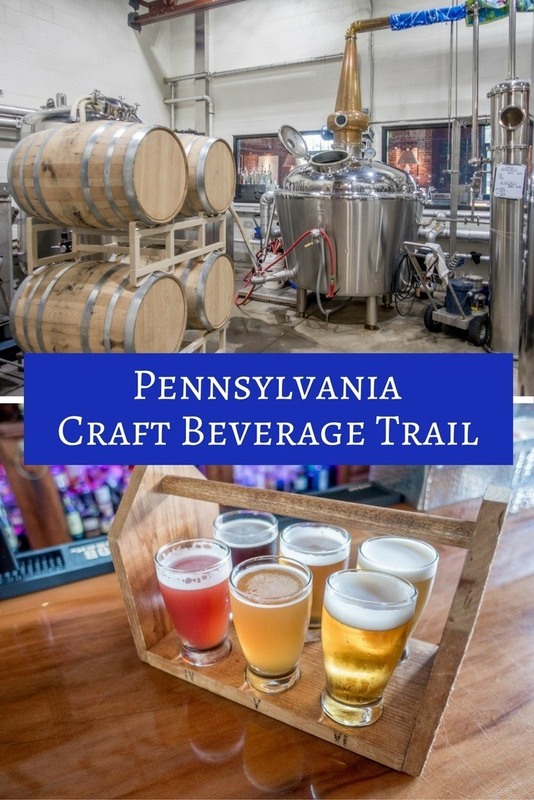 We decided that our first visit to the area would be to try out some of the great craft beverage producers that have been popping up and recently joined together to create the Central PA Tasting Trail. The dozen members of the trail include inventive microdistilleries, cideries, breweries, and wineries producing some of the best offerings in the state. 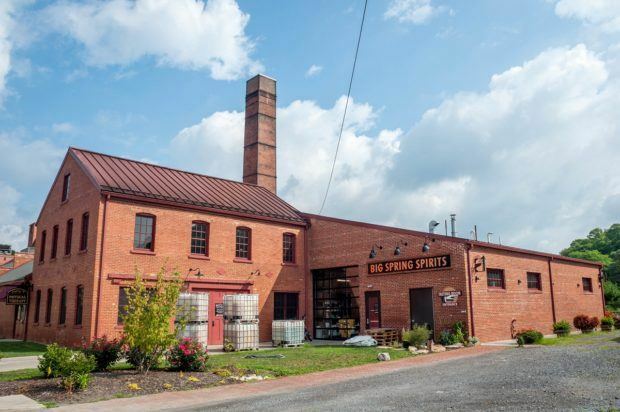 In Bellefonte, a complex that dates from the end of the 19th century now houses a very modern operation—Big Spring Spirits. The distillery, which was founded in 2014, makes more than 10 products, including a best-selling vodka, gins, and a variety of rum products and whiskeys. 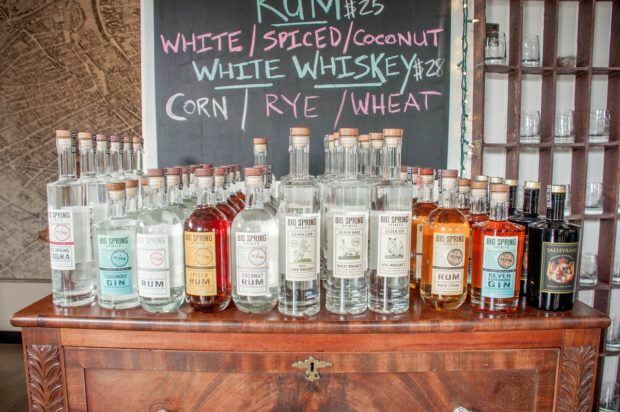 Every step of production from cooking through bottling takes place in-house at Big Spring Spirits using water that’s only 100 yards away and grains that come from within a 20-mile radius (only the molasses for rum comes from farther). It’s not just the focus on local Pennsylvania ingredients that makes the distillery distinctive. The setting is also pretty cool. The Match Factory complex, which was built beginning in 1899, is Big Spring Spirits’ home. The red-brick building’s exterior feels as historic as it is, but inside, owners Kevin Lloyd and Paula Cipar have cultivated a modern, welcoming space where we wanted to sit all night enjoying cocktails and food. The design of the distillery is intentionally eclectic and fun, incorporating a bar made from reclaimed wood and chairs upholstered in brightly-covered leftover fabric. 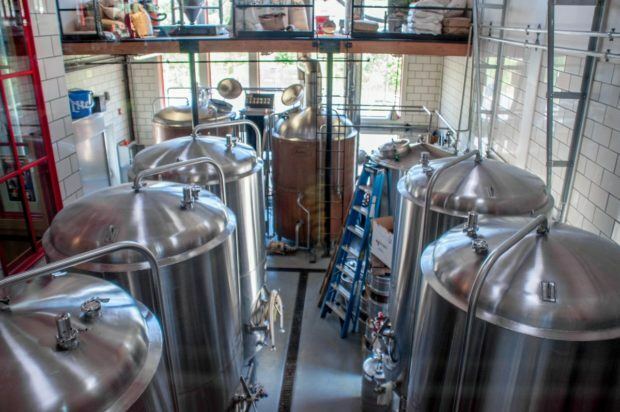 It all fits with Big Springs Spirits’ goal to limit its environmental footprint. 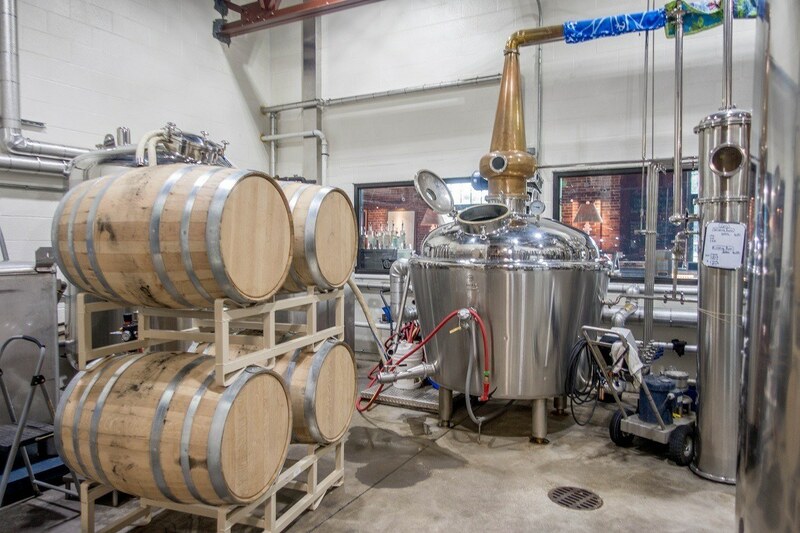 As just the second distillery in the United States to earn Gold LEED certification, they are committed to doing everything from recycling energy to returning spent grains to local farmers for feed. Big Springs Spirits hosts regular events like tasting dinners and their monthly Science Pub where a local expert speaks about an engaging scientific topic…accompanied by food and beverages, of course. Tour/tasting: 30-minute tours are $15 per person and include a cocktail or non-alcoholic beverage plus a tasting of three spirits. Tastings are also available at three spirits for $2.50 or six for $5.00. See their website for additional details. Like many producers in the craft beverage industry, Good Intent Cider started as a hobby and took on a life of its own. 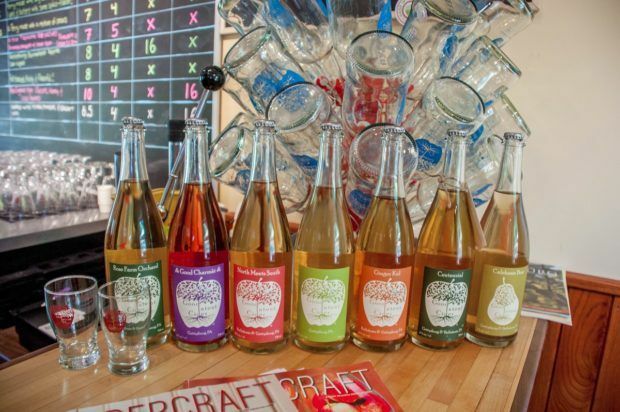 Today, the tasting room in Bellefonte regularly offers upwards of 10 different varieties of hard ciders. Since cider is one of our favorite beverages, we were excited to try them all. How does Good Intent Cider come up with more than 10 different apple-based beverages? Well, the simple answer is “creativity.” The slightly longer answer is that it takes a lot of hard work, and Good Intent goes well beyond apples. Owner Adam Redding started his cider making as a hobby in 2010, pairing a personal interest with his background in environmental engineering and chemistry. It didn’t hurt that he lived in Adams County (where Gettysburg is located) the center for apple production in Pennsylvania. After a stint producing in his parents’ home, he decided to open the tasting room in Central Pennsylvania, incorporating apples and other fruits. On our visit to Good Intent Cider – as on any regular Saturday afternoon in the tasting bar and patio – we were spoiled for options. We got to try two pear cider options (some of our favorites) along with “Don’t Tell Dylan,” a beverage made from pineapple and brown sugar. The remaining ciders were all apple but made from different blends and aged in different ways. One of the most popular varieties is “North Meets South,” an apple cider aged in bourbon barrels that impart smoky notes into the beverage. Our absolute favorite was Centennial, an apple cider made from apples grown in Gettysburg National Military Park that gets a hint of vanilla from time aging in oak barrels. The first two things that caught our attention as we approached Happy Valley Brewing Company were the smell of the wood-burning oven and the sign directing visitors inside to get their growlers filled. Kind of the perfect first impression. Once inside, we were greeted with an environment full of character, great drinks, and some of the best food we’ve had anywhere. 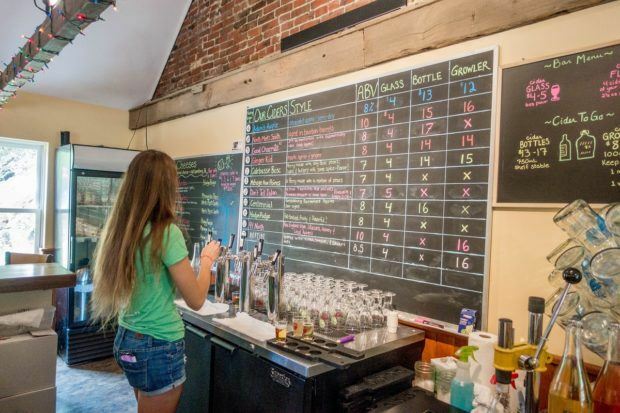 The first floor of the 200-year-old barn that houses Happy Valley Brewing Company features the sign of its original owners, Klinger Farms, along with laid back furniture, a classic wood bar, and murals depicting gods and cherubs with pint glasses and beer helmets. Downstairs, the pub-like cellar features regular live music and plenty of televised sports. While the décor is carefully curated to make you feel at home no matter which floor you’re on, it’s the items coming from the kitchen (and the brewery and the bar, of course) that are the real stand out at Happy Valley Brewing Company. For lunch, we tried the Bayou Bowl, an amazing mix of shrimp and grits accented with andouille sausage and a fried egg. Then came the icing on the cake – the Klinger Chicken Dinner. A massive portion of perfectly fried chicken alongside a hearty sausage and sage gravy, it was absolute decadence. It was served with poached eggs and buttery, flaky cronuts. We talked about this meal for hours afterward. Alongside our absurdly delicious lunch, we got to try out the reason that Happy Valley Brewing Company is on the Central PA Tasting Trail—its variety of craft beers. Lance sampled a flight of six of the 12 options brewed on-site. Happy Valley features a number of West Coast-style, hop heavy IPAs and European-inspired lighter beers. The HayDay, a light American Wheat Ale, and the ZZerbert, a Lambic-style fruit beer, were both excellent on a hot summer day. But just because they’re a great brewery doesn’t mean they overlook the rest of the beverages – we also got to sample a cocktail option with housemade syrups. Beer and pizza are just about the perfect combination for a laidback weekend in Central Pennsylvania. And you can find both made flawlessly at Robin Hood Brewing Company in Bellefonte. Robin Hood Brewing Company grew out of Home D Pizza (hence, the great pies) in 2014. Head Brewer Chris Schell crafts a wide variety of beers from porters and stouts to lagers and blondes in the in-house brewery adjacent to the bar and myriad TVs broadcasting every sport you could ask for. 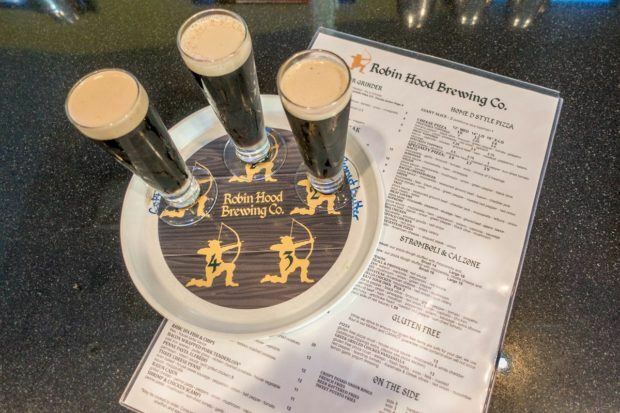 With a strong emphasis on seasonally-inspired and rotating beers, Robin Hood brings beer drinking variety to central Pennsylvania. Lance found the darker beers, particularly their porters, to be remarkably tasty and complex. The peanut butter porter has made it on his list of all-time favorites. Taco pizza is SO good! 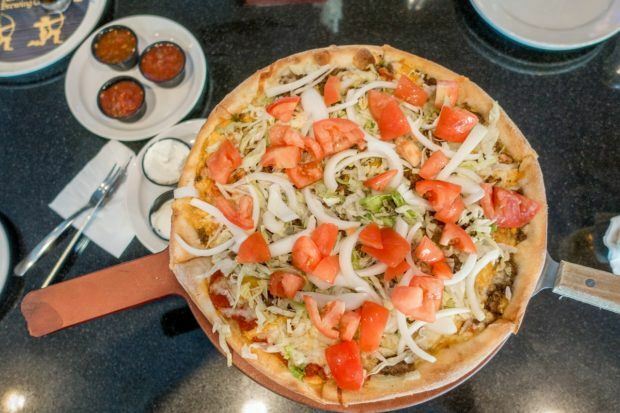 The menu goes well beyond standard bar fare to include not only pizza but salads, sandwiches, burgers, and calzones. 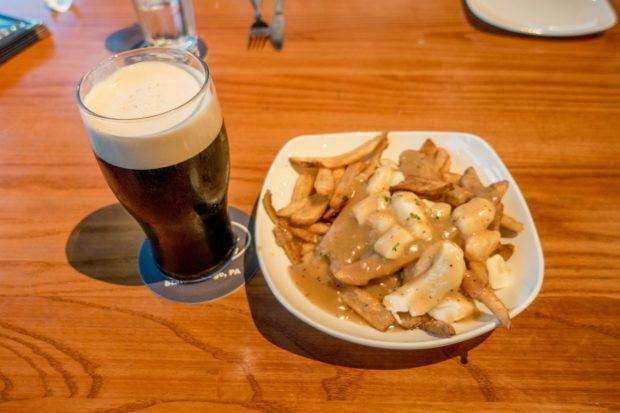 Whether it’s the beer cheese that comes with their warm soft pretzels or the drunken mussels doused with pale ale, many of the items are cooked or served with the Robin Hood Brewing Company’s frothy creations. The brewery has regular live music and hosts homebrew competitions and other special events. A veteran of the craft beverage scene in central Pennsylvania, Otto’s Pub and Brewery has been making a broad selection of beers for over 14 years. Head brewer and co-owner Charlie Schnable is a Penn State alum who oversees the creation of Otto’s offerings, from traditional style ales and lagers to the root beer and hard cider also available in the pub. 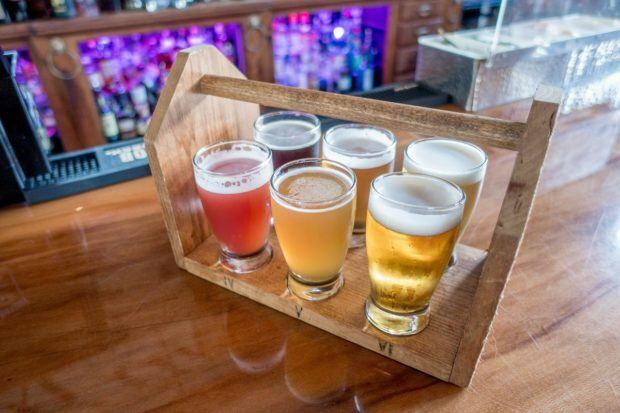 Otto’s Pub and Brewery is focused on using high-quality, local ingredients—a commitment they reinforce with their list of over 30 providers from around Pennsylvania. The farms, bakeries, and other producers contribute to Otto’s menu, which features burgers, sandwiches, pizza, pasta, and other pub fare, not to mention the poutine we fell in love with on our visit. 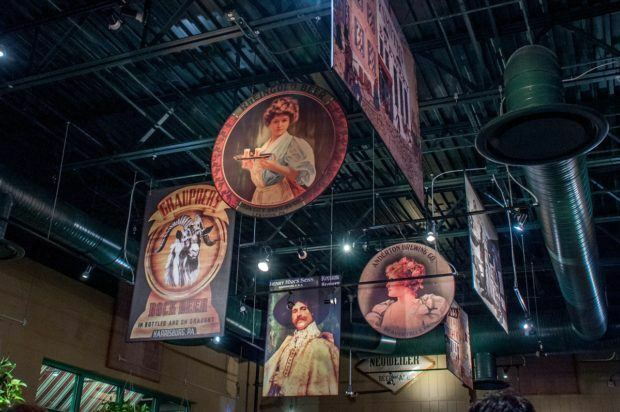 The commitment to honoring all things local is also evident in the pub’s décor which tells the history of brewing in Pennsylvania through posters, labels, and other materials on display. If relaxing on the patio with a view of the mountains, wine in-hand, is your idea of a perfect afternoon, Seven Mountains Wine Cellars is the spot. 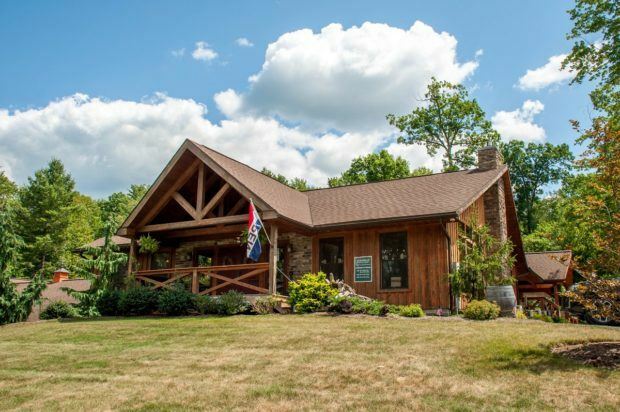 Owners Scott and Mary Ann Bubb have created their lodge not just with an eye toward making great wines but to developing an environment where visitors can have fun and relax in their scenic location. When the weather turns colder, guests can head inside to the fireplace and soft, leather couches. A hobby winemaker for over 30 years, Scott decided to make his personal interests professional and opened the winery in August 2009. Today, Seven Mountains Wine Cellars produces over 30 types of wine made with grapes and other fruits from around Lake Erie and California. The Bubbs pride themselves on their “big, bold, heavy” red wines that are easier to achieve with California grapes thanks to the longer growing season there. 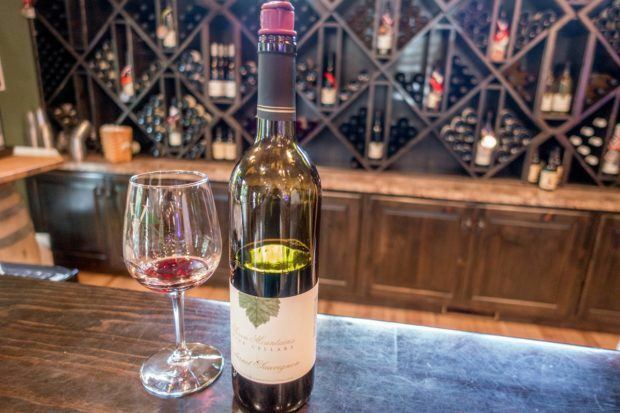 And their strategy has paid off—the wines (red, whites, and fruit specialties) have garnered numerous awards from across Pennsylvania and beyond. Seven Mountains Wine Cellars hosts Campfire Nights with live music and food in the summer and other special events year-round. With the exceptions of Good Intent Cider and Otto’s Pub and Brewery, we were the guests of the businesses mentioned thanks to Central Pennsylvania Convention and Visitors Bureau. All opinions of the smooth, fruity, and hoppy are our own. What do you think about Six Stops Not to Miss on the Central Pennsylvania Tasting Trail? My mouth is watering already… You’ve given me some fantastic inspiration to do a similar type of blog on the breweries of Northern England, of which there are some fab ones! And if I’m ever in your area, I’d definitely check out Good Intent Cider – I like ciders that are a bit different. I discovered a very moreish Mango Cider this summer in Derby (UK) ooo…to the garage I go to fetch some cider!